Making friends can be tricky and doesn’t come so easily to all kids, especially those who might be shy or anxious or quirky. Sometimes you need to be more deliberate in teaching your children how to make friends. Today, Janine of Encourage Play joins The Jenny Evolution as a guest blogger. 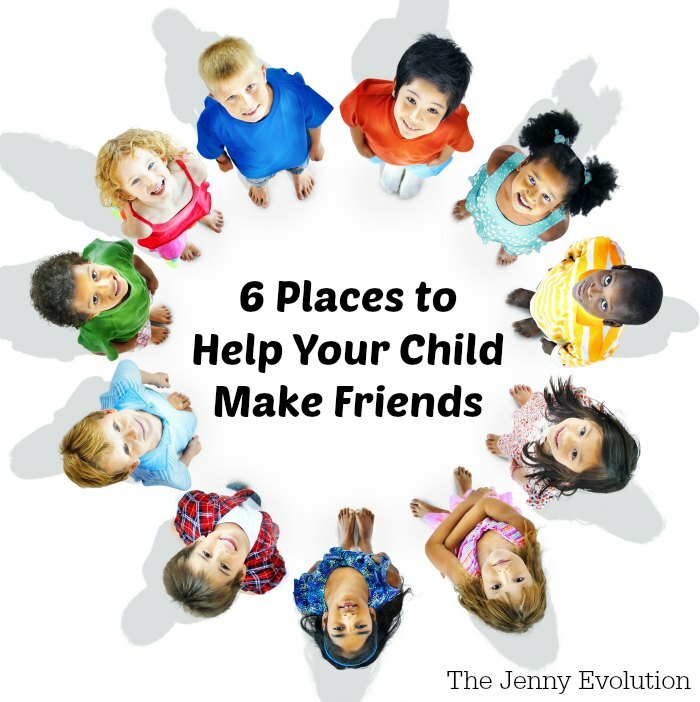 Janine says one of the key strategies to use to help your child make friends is to have them share experiences with others. The trick is finding an experience that will not be overwhelming and hopefully enjoyable. 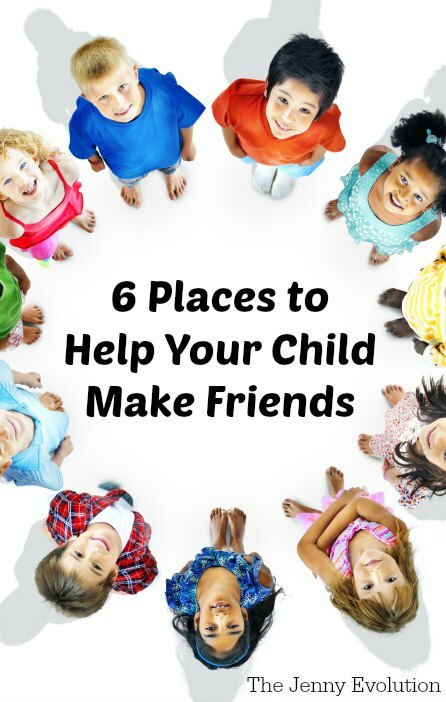 Here are some ideas of places for your children to meet others, have a shared experience and maybe begin a friendship. This is a great place to find book clubs, group crafts or gatherings of kids who have the same interests (like an animation club). Especially as we are heading into summer, this can be a great place to find activities for kids. There are lots of little local museums or centers! You can find a terrific museum you perhaps didn’t know about near you just by visiting the American Alliance of Museum or the Wikipedia Listing of Museums. Your local YMCA sometimes have programs for particular interests, like a Lego club, that can open the doors for your child. Science museums have really cool activities, like design challenges, or a hands on lab. Try some classes. Perhaps pottery, sewing or gardening. It’s good to try out a variety of activities. 4-H clubs have some special interest groups you can try out. And many towns have a rec center or organization that offers child-focused classes. Check out Check out Twitter or Facebook for people who aggregate local activities and follow them to get ideas. You might find a hidden gem for your child. It never hurts to try something out. You can stay to keep an eye on how things are going and if things are not going well, you can always leave. But give it a try. You never know what your child may like! What is an activity your child has tried? How did it go? You know, even if the friendships don’t go outside the activity, kids feel connected. I’m always surprised by my kids who remember so and so from another school who was in a class with them. Great ideas! My favorite is joining a 4-H club. I grew up in 4-H, so its near & dear to my heart and I hope my kids learn at least half as much as I did. I love that kids can interact, learn social skills and make friends, while learning so many other life lessons! Sarah, thanks for the positive feedback. I love that 4-H is still around, I remember going and loving it when I was younger! As our kids have grown older, we have found that most of their friendships are made through their sports teams. They spend a lot of time with kids that have similar interests, so it is only natural they tend to bond with each other. Great post! When your kids participate in an activity they love, they tend to connect with those other kids who are also enjoying it and find potential friends. It’s so wonderful to watch those connections and friendships develop over time! Everyone needs to find a place where they feel accepted and connected. I’m so glad to hear your son has found two! So true! My kids have definitely met kids through their soccer team.